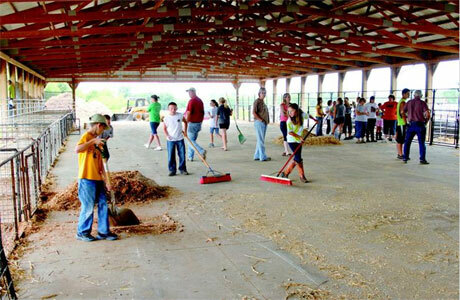 The Litton Agri Science Learning Center was a bevy of activity Saturday morning as 4-H and FFA members and their parents helped prepare the site for the annual Livingston County 4-H and FFA Fair, which begins in less than two weeks. The eight-day event runs from July 8 through July 16. (Above) Workers clean one of the livestock barns.